Looking for the next place to take your kids for a sleepover? Try the wonderful world of the outdoors! Kids love sleepovers because they get to be wild and crazy on their own with their friends. Parents usually like sleepovers because they’re a convenient way to let kids have fun in a safe environment. Regular sleepovers can become boring after a while, though. Camping, on the other hand, is the ultimate sleepover that never gets old. There’s something magical about being out in nature, and surrounded by big trees, streams, and possibly wild animals … even if you spend much of your time in a tent. 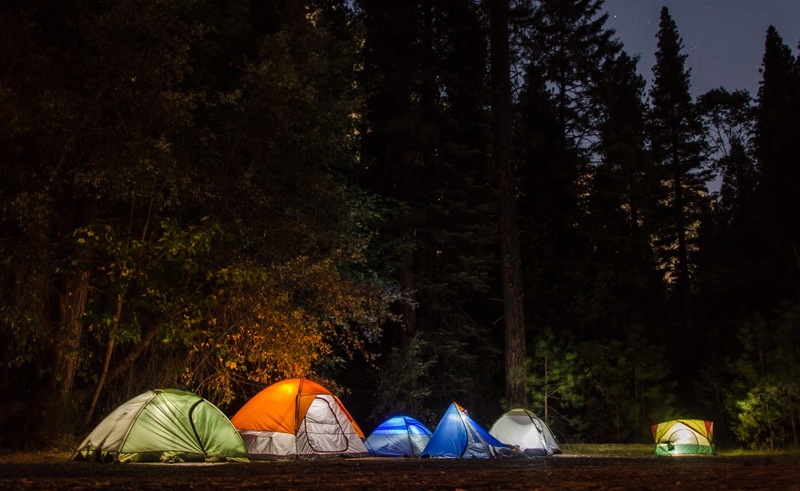 So if you want to give your kids and their friends an experience they’ll love, here are three good reasons to make your next sleepover a camping trip. Camping is more than a sleepover with friends; it’s an opportunity to commune directly with nature … a rejuvenating experience that relaxing indoors can’t match. Being outdoors encourages kids to be active and interested in their surroundings and to learn through direct experience. Describing what a poison oak rash feels like is a good way to make children fear the natural world. Allowing them to experience a poison oak rash, if you also show them how to heal it with another plant like neem, will teach them to respect the power of the natural world. Kids need to play without adults supervising and directing their every move. They also need permission to improvise. That’s why kids love sleepovers in the first place: it allows them to play behind closed doors without being controlled. Camping offers the same reward, and adds an extra level of freedom. If you’ve ever watched children play in an open field or a forest with nothing but dirt and mud with a couple of hills, you know they don’t need formal play structures to have fun. In fact, lack of structure gives them the freedom to engage their imagination more. Too many parents are afraid to let their kids play outside. Many families never go on vacation. Free time is frowned upon, and every free moment is expected to be used constructively … as if relaxing in nature weren’t a constructive way to spend time. · Plan regular camping trips. In the summer, try to plan at least one camping trip every couple of weeks. If you live near a campground, why not make it a monthly outing? · Switch your vehicle to a minivan. They’re not only a practical vehicle every day when you have kids, but you can take a couple more of your kids’ friends on trips. They’re great for hauling gear. Here’s a list of popular choices to help you find one that fits your needs. · Explore different climates. You don’t have to go camping in the snow, but you ought to give your kids the experience of camping in both warm and cold weather. One camping trip in the cold and they’ll learn how to stay warm with fleece and wool rather than cotton. They’ll thank you for the knowledge later. · Teach them survival skills and how to cook without electricity. If you don’t own a rocket stove, you should. That’s a wood-burning stove for cooking small meals. They’re compact and perfect for camping. Teaching your kids survival skills when they’re young will give them self-confidence. Kids today are deprived of nature, despite their interest. Most kids are exposed to it through television and social media shared on Facebook. Kids would love to engage with the natural world, but many aren’t allowed to. Or, if they are, the entire activity is structured around the grownups’ agendas. could last them a lifetime.